Franklin Street Works presents Neuromast: Certain Uncertainty and Contemporary Art. The group exhibition explores “emergence,” the theory that says unforeseeable results happen when a system reaches a certain level of complexity. The show’s title is inspired by a very specific emergent phenomenon, “neuromast,” which is the sensory organ that allows fish to effectively behave in unison against the threat of predators. Neuromast features sculpture, videos, text-based works, photographs and more by contemporary artists, writers and theorists interested in theories of emergence. Exhibiting artists are: Kari Altmann, Christian Bök and Micah Lexier, Ingrid Burrington, Kaye Cain-Nielsen, Mircea Cantor, hint.fm, David Horvitz, Brian House and Jason Rabie, Juliana Huxtable, Thilde Jensen, Carolyn Lazard, M. M. Mantua, Preemptive Media, Robert Spahr, Elizabeth Stephens and Annie Sprinkle’s Sexecology collaboration, and The Waterwhispers Ilse. The exhibition is curated by Taliesin Gilkes-Bower and Terri C Smith and is on view from December 12, 2013 through February 23, 2014. It will open with a free, public reception on Thursday December 12 from 5:00 – 8:00 pm. The exhibition is sponsored, in part, by the Andy Warhol Foundation for the Visual Arts. With Neuromast: Certain Uncertainty and Contemporary Art, several shared themes arose among the thirty-one works, including: how culture and gender contribute to constructing identity; the dynamic between an individual’s health and the medical industry, commerce, or the natural environment; and the collection and distribution of digital information as it relates to business, personal security, and persona. A primary inspiration of the show was a series of photographs by Thilde Jensen called The Canaries, which served as an inspiration for the exhibition. Her photographs document the lives of individuals living with heightened levels of sensitivity to the toxic chemicals and powerful electromagnetic radiation found in modern, built environments. Preemptive Media’s Air project also explores emergence and the environment through the collective work of Beatriz da Costa, Jamie Schulte and Brooke Singer. Their portable air quality measurement kits demand reflection on the proliferation of smart phones and pocket computers that do little beyond promise increased entertainment and productivity. Mircea Cantor’s video Deeparture juxtaposes predator and prey by placing a wolf and a deer in a typical white cube gallery space. The artist calls into question traditional narratives of danger and the inevitability of death while he simultaneously hijacks the gallery by excluding art objects and audience. With Elizabeth Stephens and Annie Sprinkle’s Sexecology project, the artists approach nature very differently, creating performative weddings that link the concept of a couple’s love to our love of the planet via inclusive, largely unscripted community events. Neuromast also approaches personal identity as a microcosm of larger complex systems. Juliana Huxtable’s portrait series Seven Archetypes explores her process of gender transitioning through cultural expectations of performance. M. M. Mantua’s sculptures ask viewers direct questions that hint at the unequal distribution of privacy between viewer and artist while creating cognitive engagement through language. Brian House and Jason Rabie’s Facebook Portraits present identity through algorithm and data, attempting to humanize the ways in which social networks identify and classify their users. Kari Altman’s site-specific iteration of her Smart Mobility/Invisible Protection series calls into question abstract ideals of security as they relate to identity in finance and branding. Moving out in scale to broader social phenomena, lngrid Burrington’s Center for Missed Connections identifies configurations of socially and sexually disconnected people in New York City through the missed connections section of Craigslist. David Horvitz also tried to change collectively authored online information through his zine documenting the artist’s attempted removal of himself from the group-edited encyclopedia site Wikipedia. Another text-based work that involves collaboration and an unpredictable outcome is Two Equal Texts by Christian Bök and Micah Lexier. 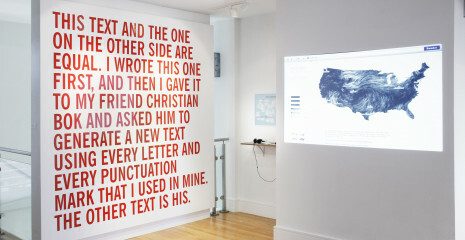 The large vinyl wall work is an elaborate anagram that consists of two texts placed on either side of a freestanding wall. One side features Lexier’s descriptive text, which outlines the terms of the collaboration; the other side hosts Christian Bök’s elegantly resolved anagram of Lexier’s original text. Kaye Cain-Nielsen’s installation Miranda further explores the social consequences of shared responsibility in relationship to her own experience as a potential paid egg donor to an infertile couple. Using contemporary art as its starting point, the artists in Neuromast investigate complex systems within social, environmental, and personal fields. The exhibition shows ways in which collective small-scale actions can prevail against seemingly insurmountable odds. Writer and activist Adrienne Marie Brown adds, “Rather than laying out big strategic plans for our work, many of us have been coming together in community, in authentic relationships, and seeing what emerges from our conversations, visions and needs. We can define emergent strategy as intentional, strong because it is decentralized, adaptive, interdependent, and creating more possibilities.” The artists in Neuromast: Certain Uncertainty and Contemporary Art join in an interdisciplinary conversation on emergence via the adaptive and generate approach Brown sites, giving us insights into the often invisible, yet shared, complex systems that pervade our everyday lives. Kari Altmann, Christian Bök and Micah Lexier, Ingrid Burrington, Kaye Cain-Nielsen, Mircea Cantor, hint.fm, David Horvitz, Brian House and Jason Rabie, Juliana Huxtable, Thilde Jensen, Carolyn Lazard, M. M. Mantua, Preemptive Media, Robert Spahr, Elizabeth Stephens and Annie Sprinkle’s Sexecology collaboration, and The Waterwhispers Ilse.